Wilhelm Grimm, of the popular storytelling duo the Grimm Brothers, was born this day in 1786. 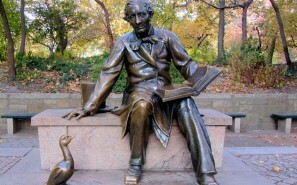 He and his brother Jacob are known for their amazing collection of fairy tales, with stories like Snow White and Rapunzel. 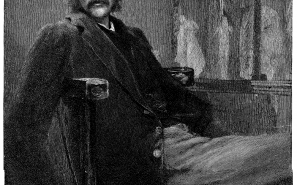 The two were historians and researchers who began collecting tales for publication. 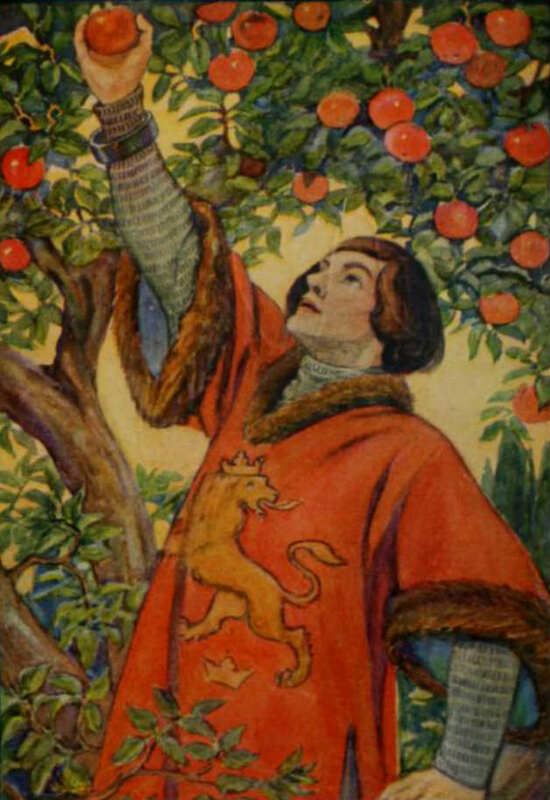 Many of these stories are retold over and over today, appearing in adaptations in the form of novels, movies, television shows, and even stage plays. You may think you know some of the Grimms’ fairy tales, but did you know that these folk tales are from the brother’s large collection known as Household Tales (also known as Kinder- und Hausmärchen, Children’s and Household Tales). Household Tales was first published in 1812 and introduced the world to the amazing collection of European folklore that had been present for so many years. Jakob and Wilhelm Grimm had collected the fairy tales from storytellers they met, including aristocrats, peasants, and other figures. 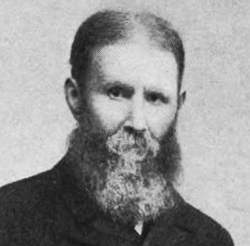 Some of the Grimm fairy tales were also rewritten from the original work of authors like Charles Perrault. 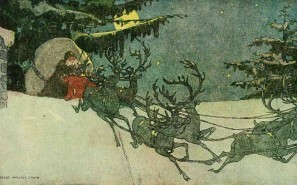 As we mark the birthday of Wilhelm Grimm, one of the world’s most famous storytellers, it seems like the perfect time to share some of the Brothers Grimm’s lesser known fairy tales, all of which may be found here at Fairytalez.com. A sweet fairy tale about a generous girl, The Star Money features heavenly rewards for a young girl’s compassion. It’s a tale that would make a good bedtime story, and is only a 2 minute Advanced read. This Grimm fairy tale features a king’s son who decides to seek adventure, as he fears nothing. 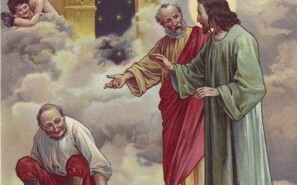 Soon he encounters a giant and boasting of his strength, determines he can do anything the giant can do. The giant sends him on a quest to pick an apple from the tree of life. However, the king’s son is about to encounter fearful things on the rest of his voyage. You’ll find this fairy tale an enjoyable Intermediate 12 minute read. The Grimm Brothers were fond of sharing tales of siblings who were turned into birds or other animals with an enchantment, but in The Seven Ravens, seven brothers’ father actually wishes them to become the great black birds. Thus their sister must go on a quest to the Glass Mountain to release them from the curse in this Advanced story that is easily read in 5 minutes. 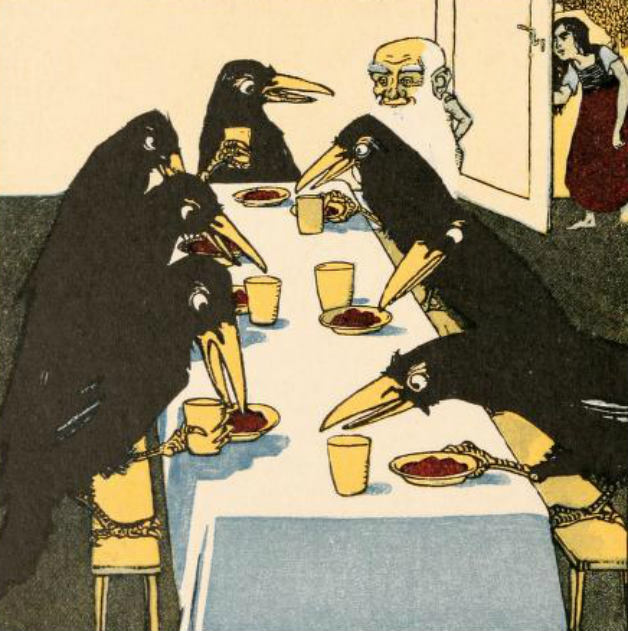 “The dwarf carried in the ravens’ dinner on seven little plates, and in seven little cups.” Illustration by Albert Weisgerber, published in Kinder-und, publication date unknown. Originally published in German. This fairy tale by the Brothers Grimm has everything you’d expect to be in a story by the brothers. The fairy tale features a girl who has two eyes, and her sisters, one of which has one eye and other who has three eyes. The two-eyed girl is tasked with taking care of all of the household chores, and meets an old woman who gives her a magical chant. This story is surprising as well, because the mean sisters don’t really get their proper retribution in the end, unlike other tales such as the Grimms’ Cinderella. It’s a 15 minute read at the Intermediate level. The Juniper-Tree is a gruesome fairy tale by the Brothers Grimm that may be known, but it’s also worth sharing. It has the haunting refrain, “My mother she killed me, and my father he ate me,” and that passage alone should give you a reason to read it. The tale is only 17 minutes, and is at the Intermediate level. Want to know more about the fairy tales of Jakob and Wilhelm Grimm? 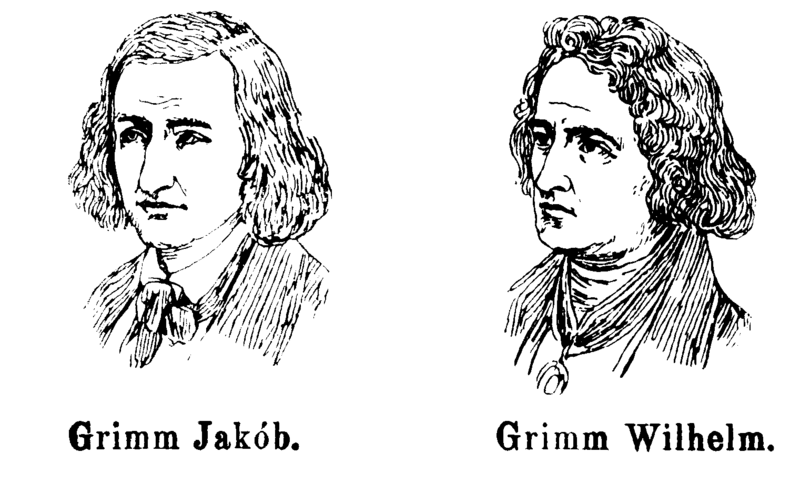 We have a comprehensive biography of Jakob and Wilhelm Grimm with images and background information, including how they collected their tales from the townspeople.